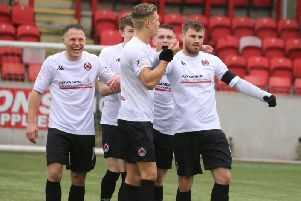 Clyde begin their preparations for the new season on Saturday when the players report for the start of pre-season training. It’s all change for the club as new boss Jim Chapman seeks to build a squad capable of mounting a promotion challenge. Defenders Jack Breslin and Jordan Stewart have joined from Hamilton Accies and St Mirren respectively and there wil be more new faces. In contrast there have been a number of departures, including midfielder Dylan Easton and former interim co-managers Jon Paul McGovern and Peter MacDonald (see page 39). 20-year-old Breslin began his career at Celtic and has played for Scotland at various levels up to under-19s, while 21-year-old Stewart came through the St Mirren academy system. Both also had loan spells at Annan when Chapman was manager there. The Clyde boss said: “This is the start of the rebuilding process and we’re starting now to make some additions that can take us forward. They are two young players that we know, they have excellent pedigrees and I think they will be excellent additions to the squad. “Jack’s a very intelligent player who reads the game well, but is also aggressive in his play. He’s captained Scotland at youth level which shows the qualities that he has. He’s very mature and not frightened to take on responsibility which is something that always appeals to me.